Friends I can’t believe I forgot to share this with you! 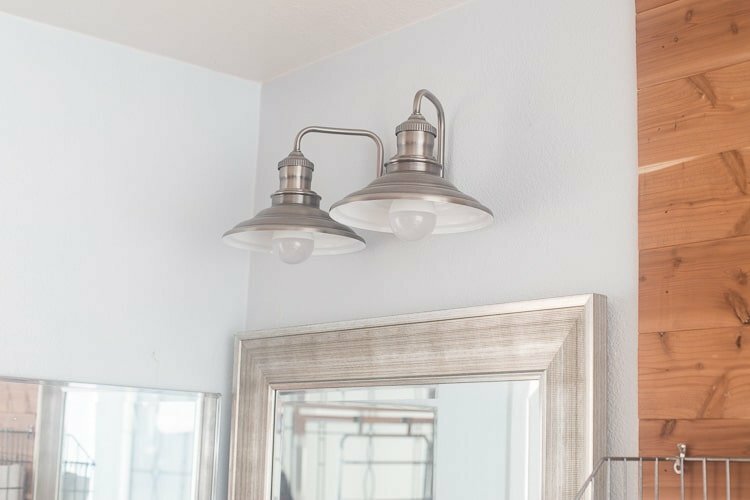 We made some updates in our master bathroom last summer and I completely forgot to share them with you. If you’re new to my blog we purchased our home at a foreclosure auction and it was a boring, builder grade home. So we’ve been gradually working our way through the home personalizing, adding character, etc. So I’ve been adding touches to create a rustic industrial master bathroom vibe. 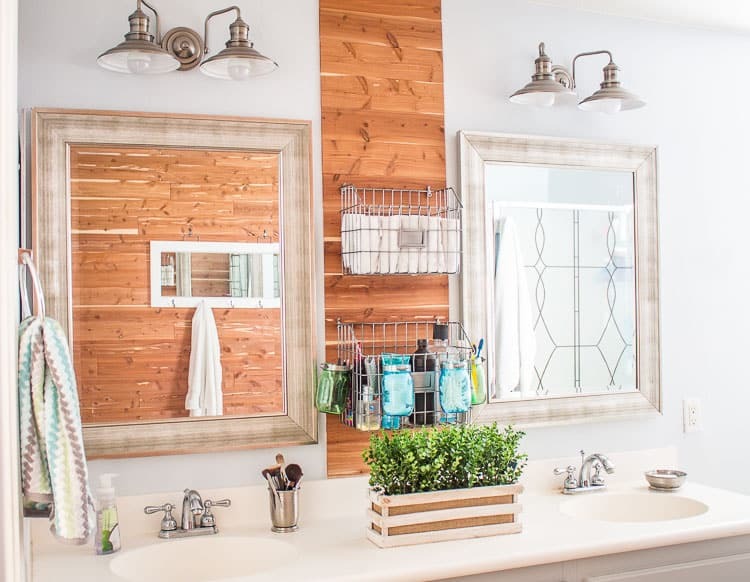 A couple years we add a cedar planked wall and then life happened and months later I got back to adding more updates to our master bathroom. Here’s the past updates we’ve done to our master bathroom so far. You’ll find affiliate links below, for your convenience, in case you want to check them out. So for our latest update we added these gorgeous mirrors which I LOVE. I bought them at my favorite place to buy mirrors… seriously they have the cutest stuff and the best prices! 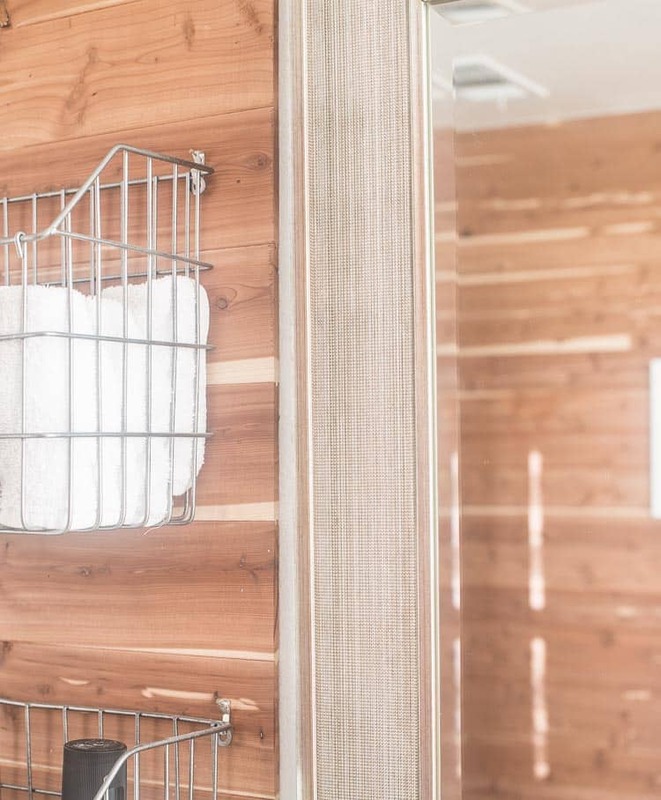 Mr. DS added a strip of the leftover cedar in between mirrors and I hung some industrial, metal baskets to store all our stuff. And those lights… love those! Let’s start with these gorgeous lights! 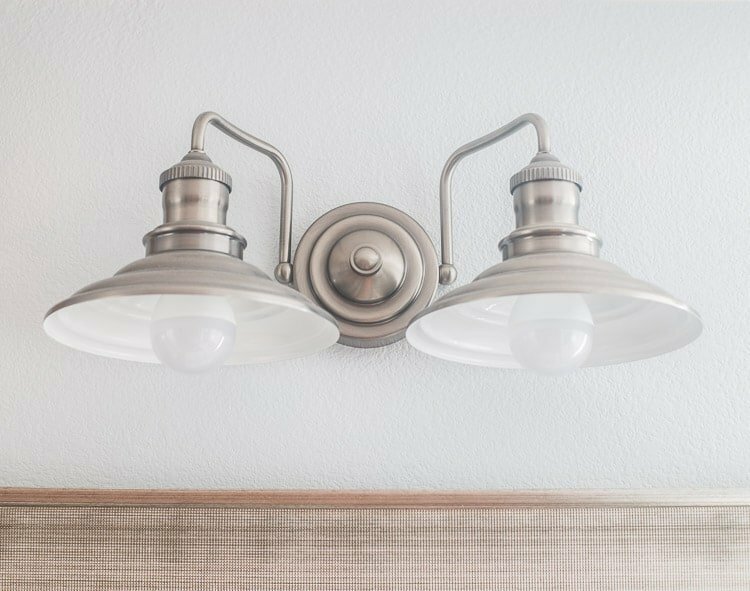 Aren’t they just the perfect industrial lights…. LOVE them! I love the pewter color, I love that the inside of the shades are painted white to help give a soft, white glow. I love the details… I just love it all. The baskets! 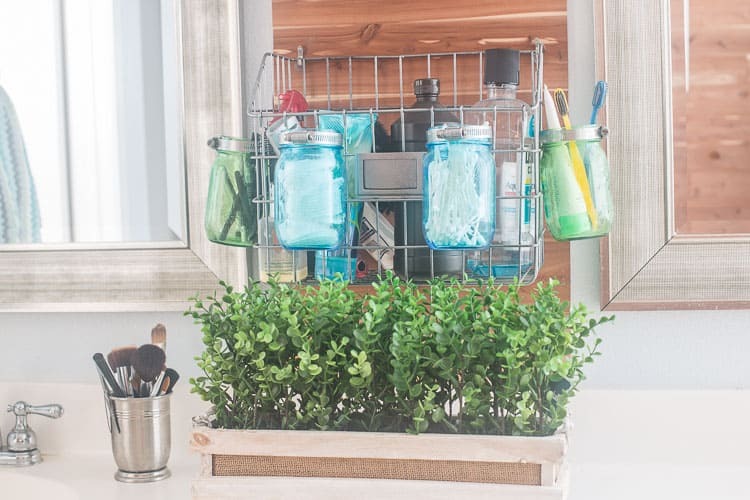 I’m a firm believe that baskets should be in every room of your home. I love that they are a catch-all and that they are pretty too! The top basket is filled with our wash clothes and the bottom has all sorts of odds and end products. I decided to add some blue and green mason jars with plumbing claps. 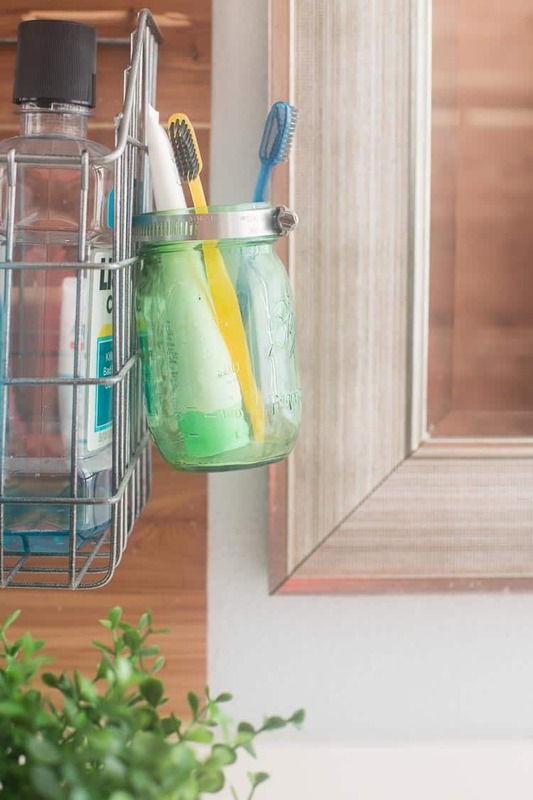 It was a great way to add addition storage without it sitting on my countertop. 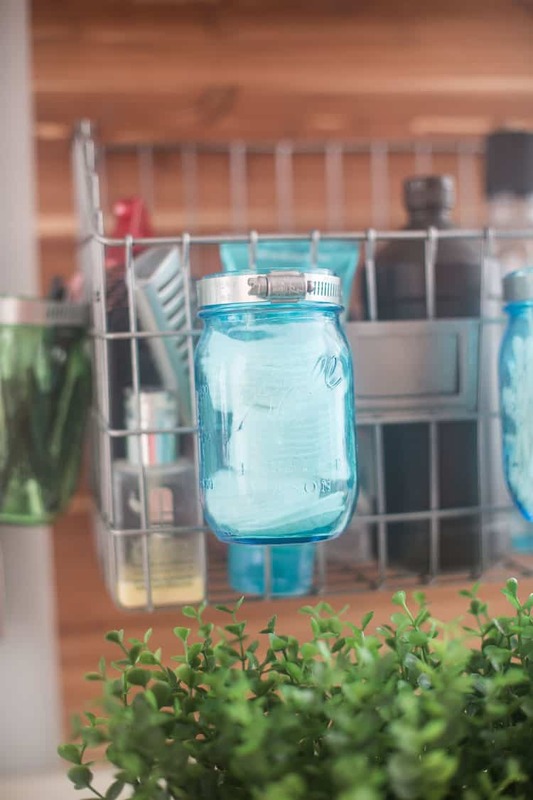 The blue and green mason jars hold all sorts of smaller odds and ends. They’re perfect for Q-tips, toothbrushes, etc. Now let’s move on to those mirrors. 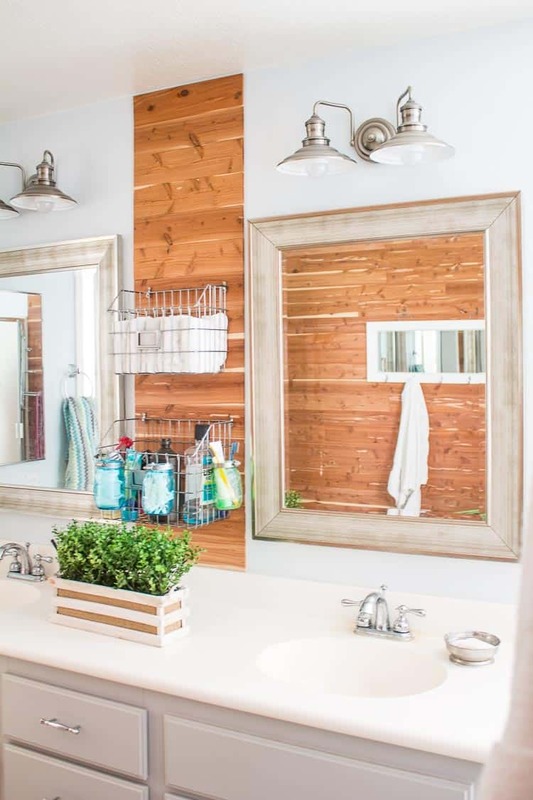 I love the textured edge on these mirrors! Aren’t they pretty? I found these gorgeous mirrors at Kirkland. They are my favorite place for mirrors! They have great prices and tons of different options. We’ve got a few more updates to make… flooring… window covering… maybe something faux in front of the bathtub? But we’re getting there! Here’s the products or one’s SUPER similar that we used. Maryann, great job on your bathroom. The double sinks are so pretty. I really love the cady on the wall with all of your toiletries. That’s such a cute idea. This space is really coming together. 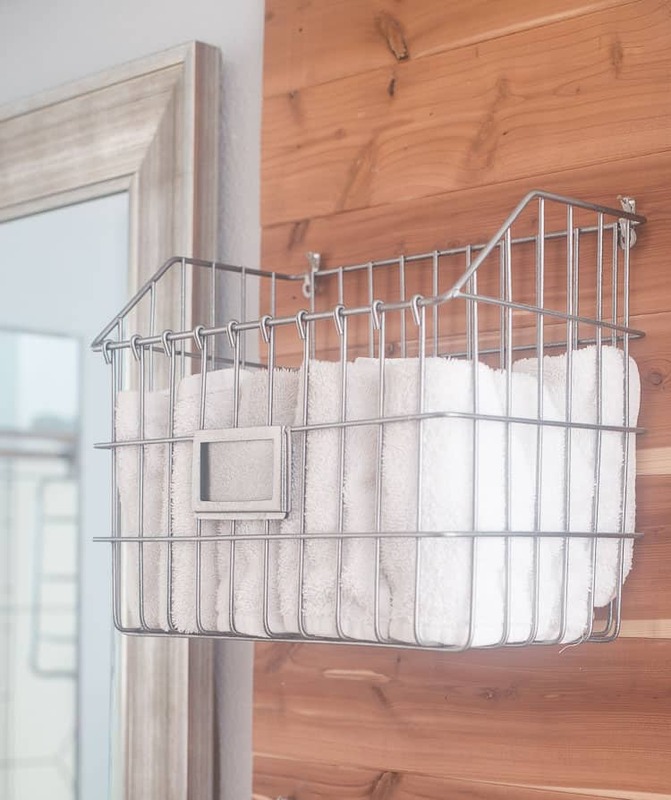 The silver pieces that you chose really add the industrial flair to the room. 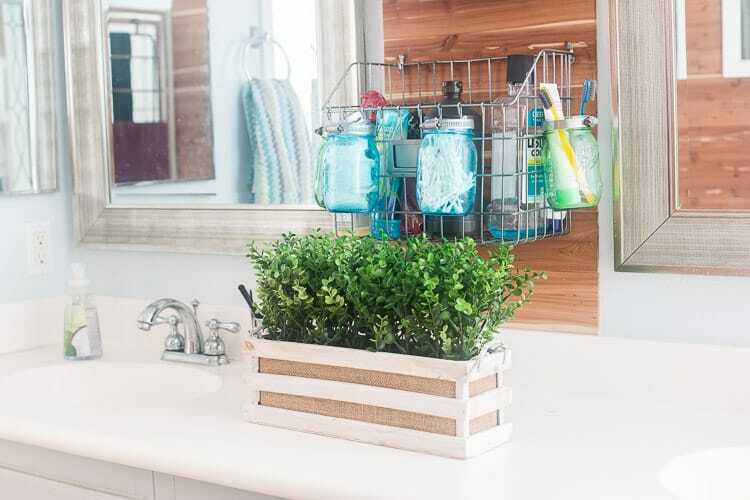 I especially love the baskets that you found and you’re right they’re the perfect home decor for nearly every room! Looking forward to seeing more. What is the paint color on the cabinets? I love the lights and the mirrors are very pretty!